Are you prepared for the BIGGEST hip-hop show of the year?? 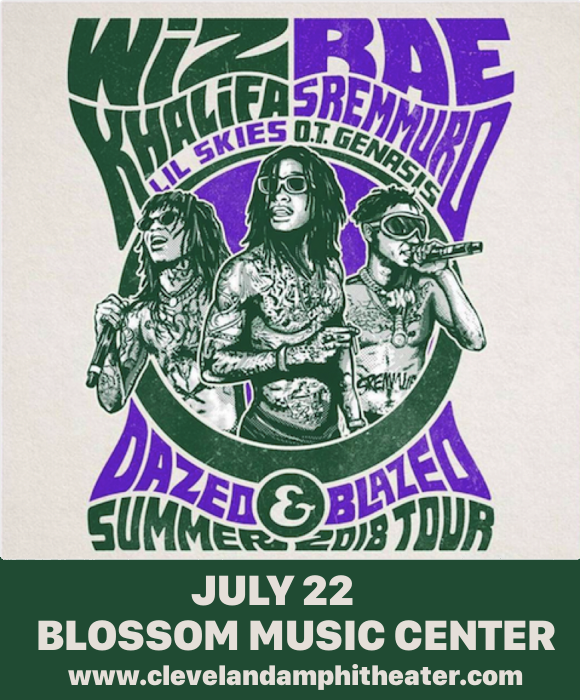 That’s right, none other than Rae Sremmurd and Wiz Khalifa are teaming up for a HUGE tour across the U.S.A with support from Lil Skies and O.T Genasis!! Coming to the Blossom Music Center on Sunday 22nd July 2018. Don’t miss out… get your tickets NOW before they disappear!! Breaking onto the popular music scene in 2006 with his debut studio album, “Show And Prove,” with his Eurodance-influenced single “Say Yeah,” achieving success on urban radio. He released his second album, “Deal Or No Deal,” with Warner Bros in 2009, and in 2010, signed with Atlantic Records. His first single with the label, “Black And Yellow,” was a phenomenal success, taken as the anthem for multiple Pittsburgh sports teams and charting at number 1 on the Billboard Hot 100. In 2015, Wiz Khalifa hit the charts again with the single “See You Again,” featuring singer Charlie Puth, written for the film Furious 7. The song became both artists’ most successful single to date, staying at the top of the Billboard Hot 100 for 12 consecutive weeks, tying with Eminem’s “Lose Yourself,” for the record for longest-running rap song at number 1 in the country!! Now, Wiz Khalifa is touring in support of his upcoming new album, “Rolling Papers 2”. Don’t miss your chance to hear all Wiz Khalifa’s new sounds live – grab your tickets to see him and Rae Stremmurd NOW while they last! !